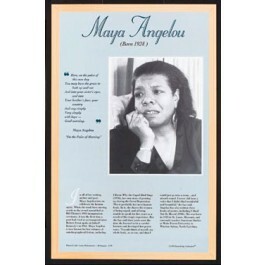 This educational poster of writer Maya Angelou features a striking photo of her, as well as a quote from "On the Pulse of Morning," and concise biographical text summarizing her life and career. 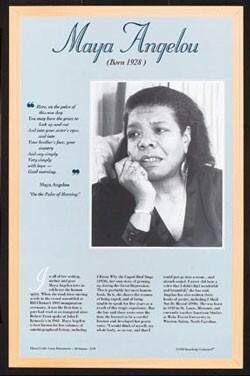 Maya Angelou is best known for her volumes of autobiographical fiction, most notably "I Know Why the Caged Bird Sings." In that book she shares the trauma of being raped as a child, and of being unable to speak for 5 years afterwards. Yet despite her difficult life, Angelou used her writing to celebrate the human spirit. This poster is a great way for students to learn about this unique American author.